BrusselsLife has chosen 7 spots that illustrate the evolutions and transformations of Brussels. This is a story of what Brussels was and will be. Since the 1960s, the automobile’s presence in front of the Palace of Justice has been same, whereas the scaffolding popped up on Poelaert’s domaine and seems to be here to stay. On the left, a horse and buggy, a tophat, and an old tram. On the right, cars whose horsepower is hidden beneath the hood and pedestrians with bare heads and running shoes. In the middle, the Minerva fountain stuck to its post, bridging the temporal gap. Upon a request by Thomas Bruce, the second Earl of Ailesbury, the statue was erected in 1754 as a thank-you to the Brusseleirs for their hospitality. After escaping the London Tower, he found refuge and love in Brussels. 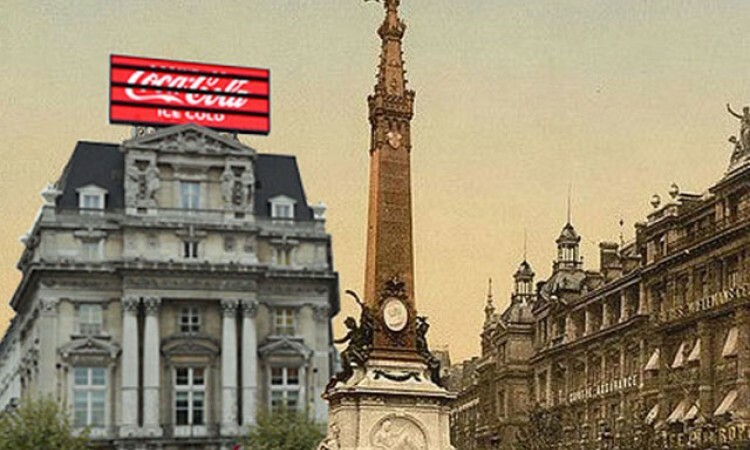 On August 22, 1897, all of Brussels united for the inauguration of the Place de Brouckère. The fountain that honors the former mayor Anspach was already the main attraction. Over the years, the fountain was surrounded by a number of bright signs and the welcome pavilion for the Expo 58. In 1973, the metro construction and the station under the square lead to the dismantling of the fountain that had to be dried up and stored away for several years. Eight years passed before she turned up again in the Quai aux Briques basin. Nevertheless, the lower shelf of the fountain was lost throughout the process. Connecting the Place Royale with the Porte de Namur, the Rue de Namur has not really evolved. Stage coaches made way for cars, and the pummeled cobblestones were recovered with a layer of asphalt. The passageway maintaining the architectural harmony of the square remains unchanged. A “brussellization” crime par excellence, the demolition of Victor Horta’s Maison du Peuple will forever be remembered as a sad day in architectural history. Built in 1896 and 1898, Jean Jaurés held a big inauguration for the building the next year. In 1965, it was destroyed for a 26 story tower of offices to be built. Some elements were conserved before disappearing during a variety of different sagas. Some glass and iron elements decorate the Horta metro station in Saint Gilles and the Grand Café Horta in Antwerp. Since last century, the landscape around the Place du Luxembourg has really changed. The train station was demolished and the European institutions were built on the old tracks. The former station was transformed into an information office of the European Parliament. In Brussels like elsewhere, the adage by Lavoisier comes to mind: nothing is lost, nothing is created, everything transforms. We are in 1905, the people of Brussels crowd in front of the Bourse on a Sunday. The horse-drawn carriages and other vehicles pulled by horses wait for their passengers there. Since 1873, the shadow of this stone vessel hovers over the new boulevards of the center, present thanks to the vaulting of the Senne.